There's 104 days of summer vacation and school comes along just to end them. The annual problem for our generation is finding a good way to spend them. I challenge you to take another step or two with your Jesus-centered core values this summer! It's grad season! High school, college and university graduation ceremonies are in full swing. After an 88 degree day on our daughter and son-in-law's roof yesterday, I can attest that our extended crummy winter-spring is finally over. The new roof is looking great, by the way. So, whether you're walking a grad line or just changing gears for the summer, how are these seven Christian core values shaping your summer focus? Are you diving into the mystery and majesty of our Creator King? Father, Son and Holy Spirit: our God is all-seeing, all-powerful, all-present, all-knowing...and eternally faithful. His loving kindness is offered fresh every day with the morning dew. I challenge you to be captivated with the knowledge of God this summer. Are you carving out time to get into God's Word? Reading, hearing, studying, memorizing, and meditating on the Bible will sink it deep into your heart and character. I've been challenged over the past 3 weeks as I've been doing young adult Road Trip Retreat nights in Tomahawk. I've be challenged to breathe fresh life and creativity into my personal quiet time. I've carved out a new journaling space and refreshed my quiet time backpack with Bible Study and prayer focus tools. It's been good. As you look across the summer months, how can you show love to your family? How can you devote time and attention to building memories together and tightening the bonds a little tighter? How can you pull your pals into the mix? It hit me yesterday while listening to Bob Uecker on the Brewers broadcast up on the roof, I'd really love to get over to Milwaukee to a Brewers game with the fam this summer. Tickets really aren't bad. It's mostly finding the time. And there's a brand new Athletic Park baseball stadium two blocks from our house. Funny, I read a blog post recently that married couples who go to baseball games together are happier. Hmmm...I've got some planning to do. Johnny up on the roof yesterday was talking about his workplace as a mission field. Wherever you're punching the clock this summer, how can you love on the people around you? Work's tough some days. You've got a source of joy in your God-connection that could make a difference for someone. How about picking one of the fruit of the Spirit to grow in this summer? Or focus on one each week? Call out to God to form that Christ-like trait in you more deeply. Remember the nine? Love, joy, peace, patience, kindness, goodness, gentleness, faithfulness, and self-control. I'm focusing on growing in faith at the moment. I'm going back to a stack of books of great faith-filled authors. This is part of the faithfulness fruit. Got any recommendations for me? Bring order to your world this summer! You can do it! Your time, possessions, health, money & career: set some goals and pursue them! Find an encourager. Sharpen each other. 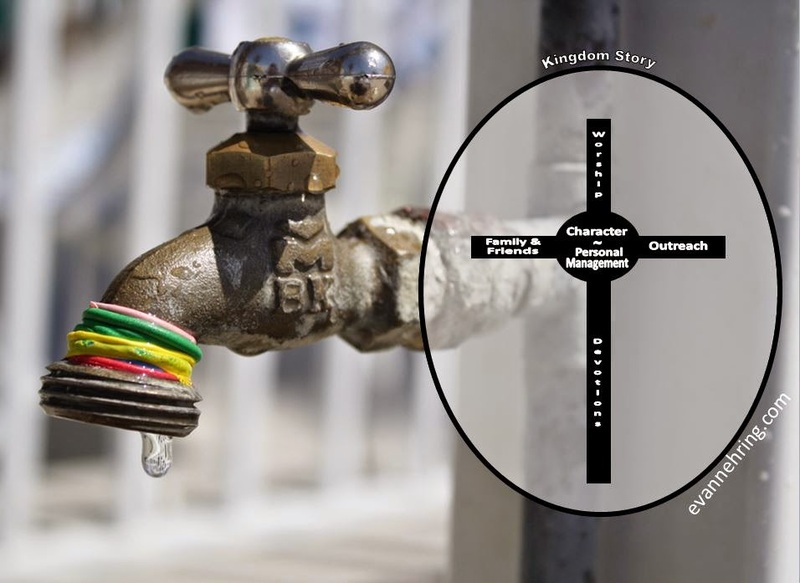 The storyline of God's kingdom story continues to be unveiled day after day. Are you finding your place in it? I've had seasons where it's been difficult to know where I fit into God's great plans. I think what I've learned is that waiting around for some great revelation isn't the way to go. Get intentional! Talk to God about it every day. Read the Scriptures with an open heart for what resonates with you personally. Talk to other about what they see God doing in you and through you. Get solid in your faith. Serve others. You'll find your place! So, what's a focus or two for your summer?